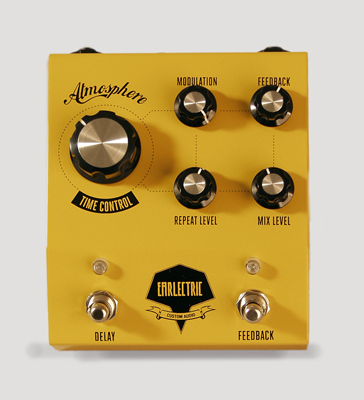 Retrofret Vintage Guitars is proud to be the sole US distributor of the Earlectric Atmosphere Delay! The Atmosphere features a vintage sounding delay, with a dedicated alternate feedback mode capable of creating lush never ending echoes. These pedals feature 5 knobs: Delay Time control, Repeat Level (feedback level in the main delay), mix level (overall volume of delayed signal), modulation (speed fluctuation, creating a pitch modulation) and feedback (only active when the feedback mode is engaged, sets the level of feedback applied.) There are two modes - standard delay and feedback. Come in and try one today! This new and improved version of the Earlectric Atmosphere features footswitches with both latching and momentary actions: press for a short time to change mode momentarily & hold to engage temporarily with deactivation upon release. Length is 5 1/2 in. (14 cm. ), 4 3/4 in. (12.1 cm.) width, and 2 1/2 in. (6.4 cm.) high. New Condition.